If there ever was a more organic way to meet a total stranger (relatively, is anyone a total stranger in the internet age?) 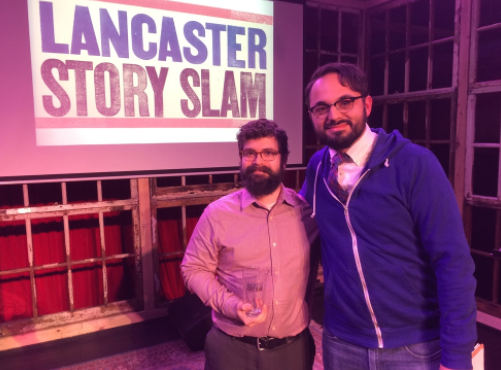 I haven’t accomplished it better than when I got together with Carla Wilson to talk about the November 22nd season finale of Lancaster Story Slam. We both arrived at the always faithful Lancaster Dispensing Company early. We both grabbed seats at the bar sensing the oncoming dinner rush. And when I saw her e-mail saying that she had arrived early with her husband, it didn’t take more thirty seconds than to discover we were seated three seats away from one another. Here’s what I knew about Carla before meeting her six days ago: She’s the Event Director and Co-founder of Lancaster Story Slam, an event in its second season which she elevator pitched as, “People reliving their stories for an audience with the raw and electric energy that comes from a live no notes performance.’ Besides that, she isn’t the artist-also-running-the-event type. Carla, who we’ve interviewed before about Lancaster Story Slam’s origins, was specifically recruited by West Chester Story Slam founder Jim Breslin for her ability to coordinate and conduct events at all stages from the venue planning, marketing, to stand-by duties in case any sort of fire (metaphorical or otherwise) breaks out during the night of the event. “And what would you say has been the biggest challenge?” I asked, curious to see the struggles from a behind the scenes point-of-view. “Not getting enough pre-orders! It’s hard to plan for a room you don’t know the size of, so we’ve been really encouraging people to make sure they pre-order tickets. It’s really tough to have to turn people away, and the finale sold out last year.” For those committed to going you can pre-order your tickets here. The grand slam will feature the 11 monthly winners from the second season as they compete to be named “Best Storyteller in Lancaster” with the theme of “Rise Above.” Storytelling who will be participate include Matthew Kabik, Liz Yocom, Beth Horenkamp, Aaron Spangler, Tony Crocamo, Audrey Lopez, Jamie Beth Schindler, Bryan R. Caine, Rebecca Thatcher Murcia, David Smith, and Aaron Lewis. Matthew Kabik (left) poses his prized pint glass trophy after winning the January event, alongside host Cliff Lewis (right) who won the 2015 Grand Slam. We both agreed it’s a good problem to have and talked about the future of story slam. While you’ll be seeing plenty of advertising for it, the scoop involves a late-night story slam event for the more raucous (adults only) crowd and a spring workshop to help people feel confident in telling their stories, whether on stage or in life. A 11 month event season is lengthy to begin with, but considering the additional events on the horizon as well, I had to ask Carla how she keeps herself motivated, especially without a stake in performing. She talked about feeling renewed and re-energized by seeing an artist come out and “leave it all on stage. Each story is a surprising and emotional journey, and because it’s unscripted there’s the constant excitement of the unknown.” We both relate over feeling a revitalization of our creative energy after seeing live music or performance; a locked in engagement that opens your mind up afterward to all the different creative things you dream to do. I finished up my notes, paid my tab, and put on my jacket, thankful for the fates at play that connected a talent like Carla Wilson’s to my local literary community, and blessed us with Lancaster Story Slam. Come out see who will be crowned “Best Storyteller in Lancaster” at the LSS Grand Slam Event, November 22nd at Tellus360. Pre-orders strongly encouraged, available here.